Happy 10th birthday Daniel !! On January 29, 2003 the Lord blessed Becky and I with another healthy baby boy and Daniel Corbin entered our lives. In case you are reading this blog and do not know our family, we have an older son, David, who will be the subject of a post like this on his birthday in July. Anyway, words cannot express the joy that Daniel has brought to our home. Little did we know that Daniel would turn out to be a very fitting name for the little boy who was born at Brookwood hospital. Daniel is tough as nails and a fierce competitor (something about having an older brother I’m told). He is extremely independent and a hard worker. As a matter of fact, it offends him if you ask about his homework. He just does it and does it extremely well! He will work for hours at a time to improve in whatever sport he is playing. Speaking of sports, I do not believe I have ever seen a child that loves sports more than Daniel does. If he has an idle minute, he will be out the door and bouncing a ball in a matter of seconds! 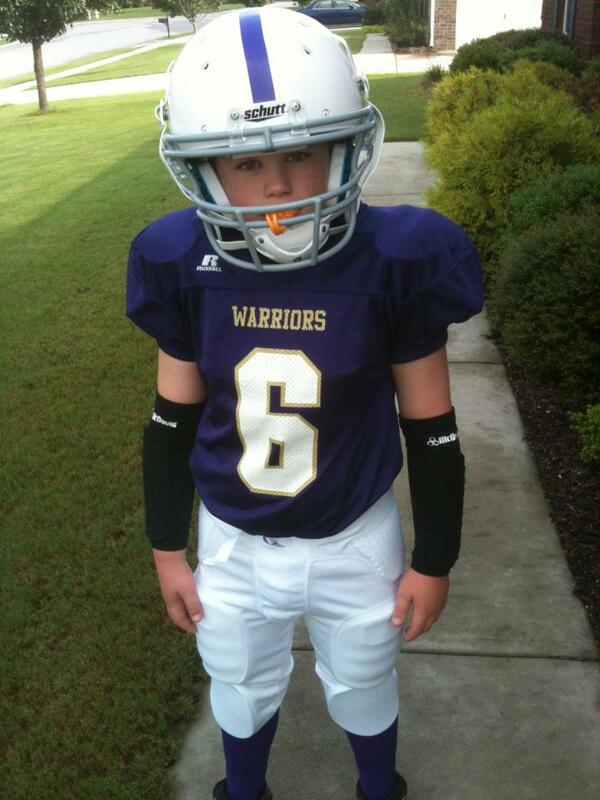 The picture above is Daniel just before his first football game this season. He also plays basketball and baseball. Most of all, I had the privilege of praying with Daniel as he gave his life to Christ one night in his bedroom. The next Sunday, I had the privilege of baptizing Daniel at Whitesburg with most of our family there. Even though he is only ten years old, I am continually amazed at how much scripture Daniel knows and how many of the Bible stories he can recall in great detail. I really do believe that Daniel knows more of the Bible than I did when I started college! He is showing signs of growing into a young man who loves the Lord and it is that for which I am most proud of Daniel. Happy birthday, Daniel! Your dad loves you, and your dad is proud of you! Oh yes, one more thing in honor of Daniel….Roll Tide! Unfortunately, this is just the beginning of episode after episode of grumbling by the people of God. The more things change the more things stay the same. I believe that one of the greatest barriers that many Christians have in their walk with God today is the barrier of constant grumbling. Some churches can’t move forward because of constant grumbling among the people. Some pastors cannot lead their churches because they themselves constantly grumble and complain. The truth is that it is easy for Christians to fall into the trap of grumbling and complaining. It can become such a way of life that we really don’t think about it. Monday mornings are prime time for many of us to be grumblers! Grumbling really means that we are questioning God’s provision and goodness toward us. Grumbling makes us unthankful and ungrateful people. When we are grumbling, we aren’t praying! Grumbling takes our focus off of the Lord and onto ourselves. Grumbling leads us to unfairly question and blame the leaders that God has placed in our lives. Grumbling leads us to focus on the past rather than what God has for us in the future. If you read through the book of Exodus, you will see these issues play out among the people of God. While this list is far from comprehensive, it’s easy to see that grumbling is serious business that can have a devastating effect on our spiritual lives. Don’t be a grumbler. Exchange grumbling with praise and prayer. Build people up and minister grace rather than tearing down. You’ll be glad that you did! Discouragement and disappointment come the way of every Christian. However, “growing weary” is when pain and disappointment (or maybe fatigue and stress) build up in our lives until we reach the point where we say, “I’ve had it. I can’t do this anymore….” This is why the same Greek word is translated “lose heart” in 2 Corinthians 4:1. We all know the difference between feeling down or having a case of the blues and losing heart. One is a bad day or week – the other is a dark time of the soul that lingers. Galatians 6:9 is for those who are about to lose heart and give up. Notice that this verse speaks of being weary of “doing good.” We expect that a Christian who is living in disobedience will grow weary, but what about a Christian who is doing their best to live for the Lord? The truth is that Christians can grow weary of even the best and most important things they are doing. It is possible to grow weary of doing the good things because those good things are not always easy and almost always draining. Marriage, children, ministry, and careers are examples of good and important things that a Christian can grow weary of. The truth is that almost every Christian, at some point in their lives, has felt like giving up on their marriage, their children, their church, or their career. Perhaps a few have felt like giving up on all of them along the way. Most readers of this blog know exactly what the Bible says when it speaks of “growing weary of doing good” because we’ve been there. We know the pain of losing heart. Maybe someone reading this blog is going through one of those times right now. The most powerful part of this verse is the end. It’s a promise…”we will reap, if we do not give up.” Keep going. Don’t quit. Live confidently that God will bless. Believe that God will honor faithfulness, even if it appears to be hopeless. What a promise! It doesn’t say to keep going because we are so faithful and wise and hard working. Oh no! It says to keep going because He is faithful and true! We can keep going through the darkest times of life because we know that He is faithful. No matter what you are going through as you read these words, God will uphold your hope too! His cause will triumph. Stay faithful because of the faithful One! Thanks for taking the time to read this post. Perhaps you are wondering, “Why is Greg doing this and what does he hope to accomplish?” First the short answer: several months ago, I felt led of the Lord to do it. Certainly, I had every excuse in the book – time, the plethora of blogs already out there, etc. To be very honest, the last thing I needed was another thing to do. However, it became a matter of obedience for me. I feel the Lord has led me to do this, and I want to do what He tells me to do. Now, for a somewhat longer answer. I had blogged a couple of times per week when I served at a church in Pell City, and briefly when we moved to Huntsville. Time and the busyness of life and ministry resulted in my withdrawal from the blog world. In recent years, I have connected with hundreds of people through the platforms of Facebook and Twitter, and I have enjoyed those greatly. Having been in full-time ministry now for over twenty years and having friends from multiple churches we have served, friends from high school and our home area of Sand Mountain, and friends we have made from our journeys over the years, I feel that having a place to connect with everyone in a more in depth way than Facebook or Twitter can provide will be helpful on many levels. Also, I have enjoyed writing since I was in high school and this site allows me to begin once again using that gift in a greater way. Finally, my plan is that gregcorbin.com serve primarily as a place where the majority of my posts will flow from my weekly study of scripture and serve to build up the church through knowledge and application of God’s Word. From time to time, I also plan to post about important church and cultural issues. Occasionally, I will also post something about my family or friends to change things up and to provide another window for further connection. If you are looking for political rants, theological debates, and commentary on everything that is “wrong”, then this site will not be for you. There are a great number of websites that already fill those roles. Gregcorbin.com will be positive, edifying, informative, and (hopefully) thought provoking. Right now, my plan is to post two or three times per week. Most of all, it is my prayer that this site will bring honor and glory to my Lord and savior Jesus Christ, to whom I owe all things. Thanks for reading and check back soon!